Vikas is the President of H2 Life Foundation. A curious observer and an inquisitive analyser, Vikas’ willingness to build a public policy and advocacy forum to voice concerns and make recommendations to the highest level of policy making, led to the conceptualization of H2 Life Foundation. Vikas is a result oriented, highly motivated and resourceful expert who has built a unique and dedicated platform to connect with policy makers, ministers and officials of central and state governments, experts from varied fields, legislators, professionals and youth to come together and work for positive change. Presently, he is also Editor – Business & Policy at Bharat Khabar, and National Executive Member of the Newspapers Association of India. Besides being a philanthropist, Vikas is a seasoned Corporate Affairs and Government Relations Specialist, holding more than 15 years of progressive experience. He has travelled extensively across India and the Globe and has hands on experience in dealing with local and international issues. He has designed and led several successful CSR (Corporate Social Responsibility) initiatives in the field of health, corporate governance, education and telecommunications. Vikas has also played a pivotal role in the implementation and execution of various government projects and schemes. He has a deep understanding of the political wind and systems of the country. He has worked closely with leading policymakers of the country and has worked at the grassroots level in numerous villages. In addition, he has held advisory and consultant positions in several prominent Government of India owned initiatives. He was a Consultant at the National Institute for Smart Government, a not-for-profit company incorporated in 2002 by the Government of India and NASSCOM. He also served as a Consultant at the National e-Governance Plan (NeGP), formulated by the Department of Electronics and Information Technology (DEITY) and Department of Administrative Reforms and Public Grievances (DARPG), GoI. In addition, Vikas was also a Consultant at the Indian Institute of Corporate Affairs (IICA), an autonomous institute which works under the aegis of the Ministry of Corporate Affairs, to deliver opportunities for research, education, and advocacy. The National Foundation for Corporate Governance (NFCG), which was set up with a goal of promoting better corporate governance practices in India by the Ministry of Corporate Affairs, GOI, in Partnership with the Confederation of Indian Industry (CII), Institute of company secretaries of India (ICSI) and Institute of Chartered Accountants of India (ICAI), is another important organization where Vikas was empaneled as a Consultant. Prior to this, Vikas worked at the National Informatics Centre, where he was a senior member of the team handling the flagship project of Regional Transport Offices (RTOs) across India. Vikas began his career in 2004 with HCL Technologies. He exited HCL at the level of Project Manager. 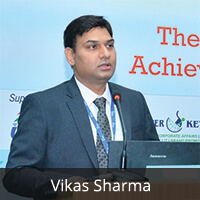 Vikas is a graduate in Commerce from the University of Delhi and holds an MBA.